What the Cluedo was that? Murder mystery in the Sistine Chapel was the game the Cardinals had to figure out, and the audience. 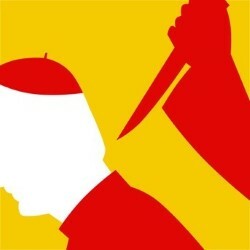 Cardinal Sin is a fun packed show about the austerity of the church, and the reality of humanity. There was even an appearance by Cardinal Satan himself – or rather – herself. A Nazi pope, A Cardinal Lovely, A lesbian love affair between Satan, and Cardinal Bees with a cameo appearance from Cardinal Columbo to solve the mysterious case of the murder in the Sistine Chapel. There was a touch of everything in this play: from Harry Potter to The Pink Panther, and a little bit of the Rocky Horror Picture Show thrown in for good measure. It sounds confusing but maybe that’s the point of the show. After all religion is about as confusing as a nest of bees that you’ve poked a stick into. The jokes come thick and fast and the audience responds quick and fast with laughter. As the tale is unravelled the body count increased as a few cardinals meet their unfortunate fate. A free show folks and you’d be lucky to get a seat. An excellent cast of people performing this farcical look at the church, and its pious contradiction to humanity. Well worth a visit to the confessional for.